New York City’s Department of Transportation is working with the Office for Visual Interaction to create new LED efficient street lamps to replace all of the HPS and Mercury Vaopr lamps that exist currently. The city’s cost savings and maintenance hours are all things that are under consideration, with the LEDs having an ultimately longer life than the HIDs in use today. 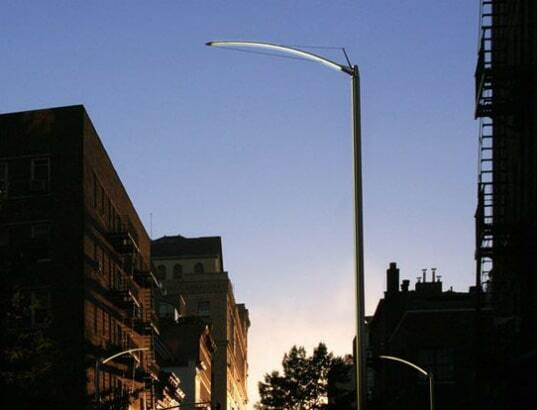 In 2004, an international design competition was launched to create a new standard streetlight for the City of New York. Our design was selected after a two-stage competition process, and will add to the City’s existing catalogue of fixtures to light streets, sidewalks, and parks within the city’s five boroughs. In creating a streetlight that will become a new classic, we asked ourselves, “What is the light source of the future?” Hi-flux LEDs emerged as an outstanding solution. With their small size, low wattage, intensity, and extremely long life of over 50,000 hours, LEDs are preeminent as an energy efficient, minimal-maintenance source. Rethinking the aesthetic potential of LED technology was a driving force for the streetlight’s elegant form. In contrast to the bulky cobra-heads associated with high-pressure sodium lamps, the streetlight takes on a slim, elongated profile enabled by the tiny size of its light source, which does not require a hefty decorative enclosure. Instead, the thin arc of the luminaire itself provides the necessary surface area for housing and cooling the LEDs. The revolutionary aesthetic of the streetlight is specifically derived from the requirements and possibilities of LED technology. The bulbs themselves for this $1.175 million contract are being designed by Lighting Science Group and the company expects that for each pole and light source that is replaced, the payback period for the city will be two to three years. Not only will the city reduce its power usage 25 to 30 percent, but the bulbs will last 50,000 to 70,000 hours. Today’s sodium lamps are rated at 24,000 hours, which means at that point half of them are dead. The L.E.D. life rating actually means that the bulb will drop below 70 percent of its original brightness after 50,000 hours or so. 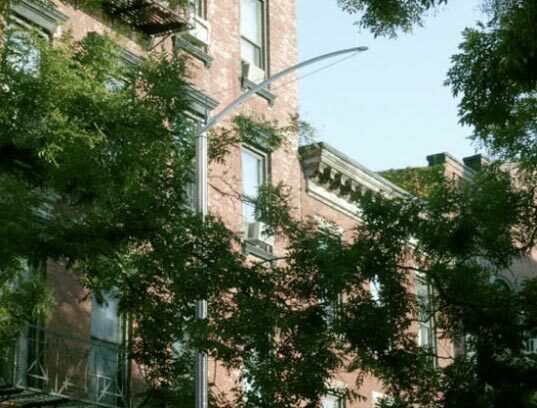 New Yorkers shouldn’t get too excited yet – the pilot project is going to replace six poles. Just six. Let’s hope this catches on! Previous articleWeekly WYSIWYG: R23 is Coming! It sounds to me they got hooked for some way out project. Seriously folks, there are better things to spend money on than reinventing the wheel with a proprietary LED design project for NYC. No wait, does anyone know who will own the IP? If they went with Elumen, it would have cost under $10K… that would leave $1.165 to deploy many more and start saving energy…. is that not the point in the first place? Needs to be solar powered, self activated by low light conditions, and why do lights in our pedestrian dominated city only face the street? It should also illuminate the sidewalks as well. Unless this light can bleed enough light into the sidewalk. The sidewalk should be as bright as the street. Also in parks it should be motion activated with 360 degree coverage.